VA IS LYING. VETERANS ARE DYING. Is it going to far or is he right on target here. VA IS LYING. VETERANS ARE DYING. I know this is not totally gun based, but We want to know what you guys think of this story. 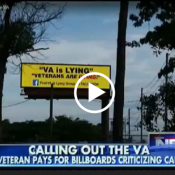 A veteran in Florida is paying for 2 huge billboards shaming Veterans Affairs. Thoughts?